Join astronomers Patrick & Joanne Poitevin, the team behind "Scopes for Special Educational Needs", for an extra special evening observing the the moon and planets using telescopes. There's a small admission fee asked for on the door with all proceeds directly supporting their fantastic charity which donates astronomy equipment to numerous schools and institutions and includes a raffle to win a telescope! Please do go along and support this astronomically worthy cause! No booking required, simply turn up on the night! 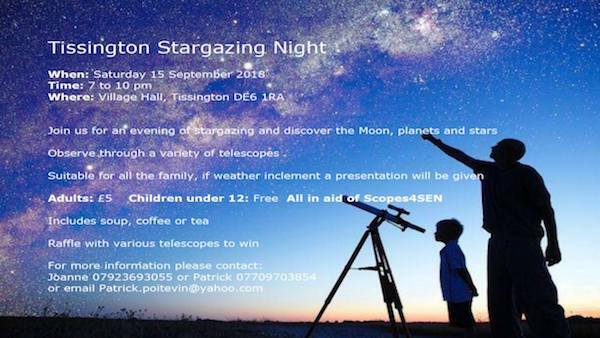 The below graphic shows if and when it will be dark at Tissington Village Hall on the evening of this event. Yellow areas show when the skies are not dark due to daylight (bold yellow) and moonlight (faded yellow). Click on the image for an explanation on how darkness is determined.